NEW Dragonflies! Color Your Own Bandana with markers! Original design! Great activity for kids, camps, scouts, rainy days vacations! Inspire Kids of All Ages to Love Nature! Play our Fundanas games-learn, burn off some energy and have fun too! Also take a look at our unique products from Egypt. Unique, affordable, educational! Fundana Bandanas & More-Unique, Educational, Fun Products from near and faraway! New! 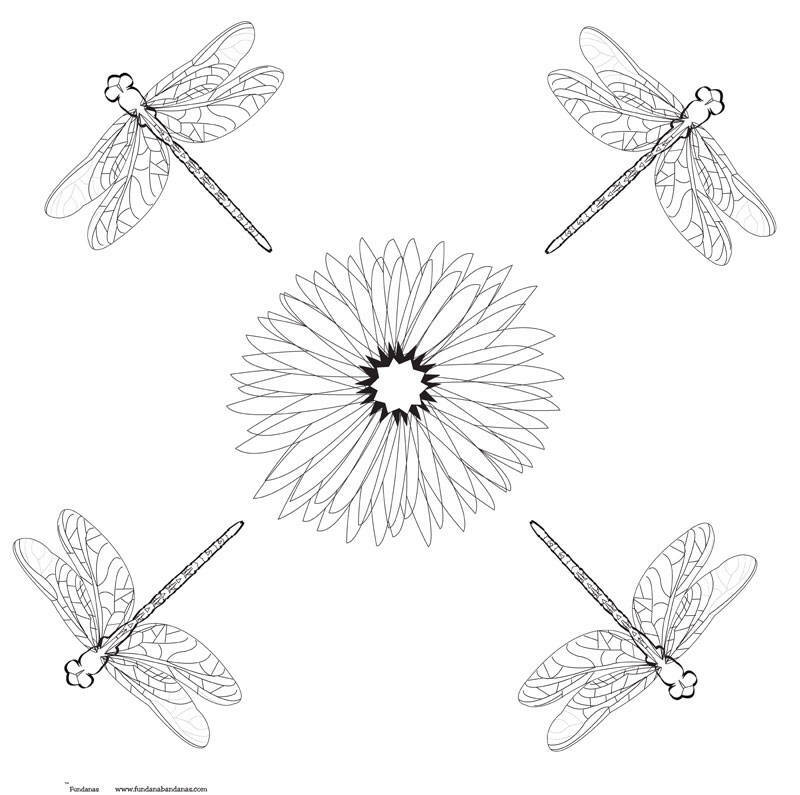 Dragonflies Color Your own bandanas with 12 color washable markers! They are screen printed on made in USA, 100% cotton, 22 inch white bandanas. Kids/Adults can color it, frame it, wear it! 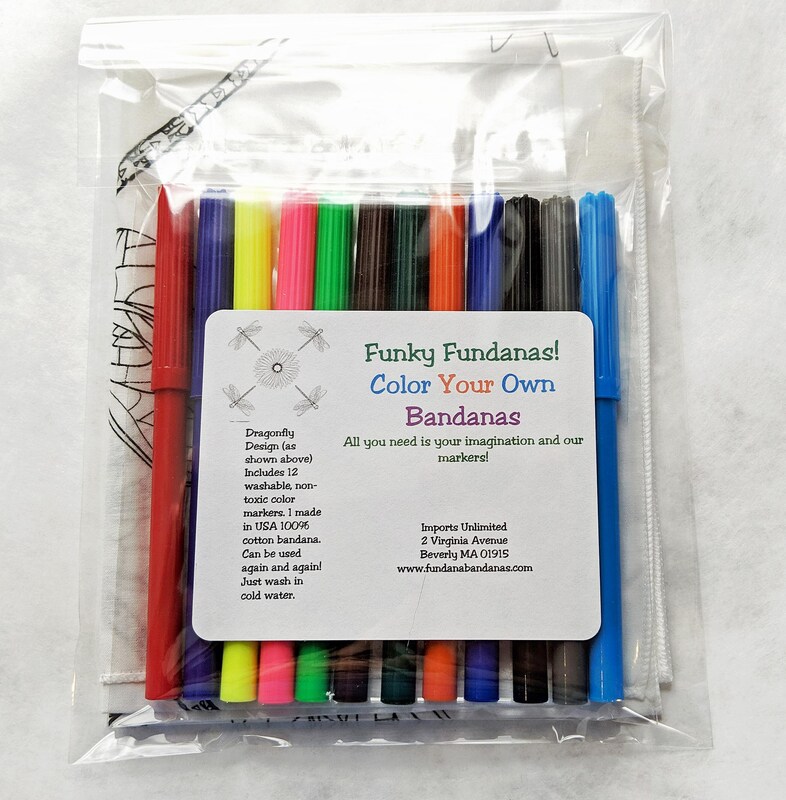 Funky Fundanas are a great activity for a rainy day, during down time on vacation, birthday parties, scouts, camping, stocking stuffer, great for special needs activity and more! Imagination is all you need! Makes a great, inexpensive gift. We do custom work! Put your logo, school, camp, kids favorite cartoon character on our bandanas! We do have a minimum. Please contact us at fundanas11 [!at] gmail.com for more information. We accept Visa, Mastercard, Discover Card, American Express and Paypal. We are here to assist you, please, contact us with questions before placing your order. CANCELLATION POLICY: Orders must be canceled within 2 hours of purchase. * if anything in the order is incorrect or damaged I will gladly replace and mail out ASAP. Just send me a pic of the problem and I will redo. We are not responsible for packages that were stolen and there was proof of delivery. All shipping is done via USPS First-Class mail and Flat Rate USPS mail (depending on product) unless requested otherwise. Once Shipped, orders usually take 2-5 business days to arrive within the USA. © 2019 Fundana Bandanas & More-Unique, Educational, Fun Products from near and faraway!